No matter what your gardening situation or planting zone, if you have a garden spot that gets at least 6 hours of sunlight per day, you can grow the Queen of the Climbers - Clematis. You've likely seen it before, and have probably wondered what that beautiful plant was that caught your eye as you drove down the street. Now you know! Nobody should be without this incredibly versatile landscape plant! The uses in the landscape for Clematis are almost limitless. 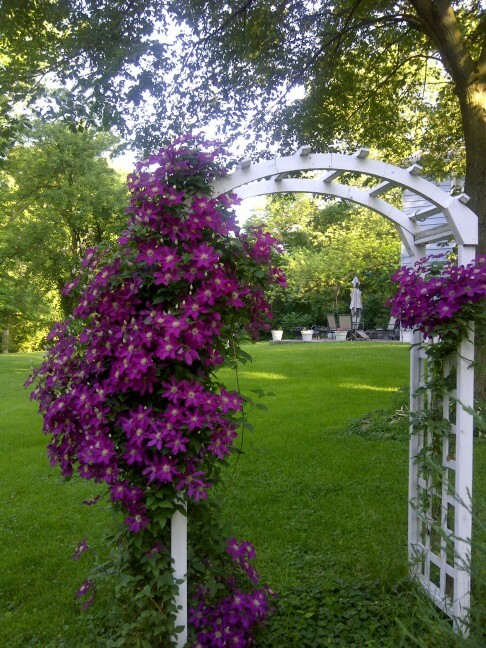 We see it most often clambering up a mailbox or trellis, but Clematis also lends itself well as a specimen plant, pole climber, tree climber, trained against a wall, chimney, or porch, climbing up a garden arch, or weaved into existing shrubbery that needs a bit of color. Left on the ground, Clematis makes a wonderful ground cover or rock garden specimen, can be woven into the perennial garden to fill in bare spaces, and makes a wonderful addition to the habitat-type garden, as bees and butterflies love it. In containers, it makes a beautiful statement either alone or with colorful annuals growing at its feet. Clematis has an undeserved reputation as a finicky and difficult plant to grow successfully in the garden, but nothing could be farther from the truth. 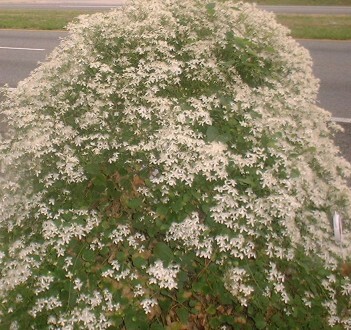 If a bit of care is taken as far as soil preparation and placement, one or more of the Clematis varieties can turn a mediocre landscape into a traffic-stopping display. Additionally, if chosen carefully, a combination of several Clematis plants in the garden can provide economical bloom from early spring until late fall - year after year! There are hundreds of Clematis varieties to choose from, well beyond the scope of this page, but basically Clematis come in two types - large flowered and small flowered. Depending on the variety, vines can grow 20 feet or more in length. Though you might be drawn to the larger-flowered types at first, the smaller flowered varieties make up for their small size by becoming almost fully covered in beautiful, sweet-smelling blooms. A two year old Sweet Autumn Clematis is pictured here, illustrating how thickly these plants are capable of growing in just a year or two. Since Clematis is a perennial and may live for 50 years or more, giving it a good start in an appropriate place in the garden is the most important factor in whether it succeeds or fails. These plants like cool feet, but lots of sun at the top, so heavy mulch replaced every year is advisable. Prepare a hole at least two times the diameter and depth of the pot, and add generous compost and maybe some peat moss and manure, depending on the condition of your soil to begin with. The object is to create a well-drained, rich soil. Plant Clematis deeply, much like you would a tomato plant, as Clematis will grow additional roots from any nodes buried in the soil, making for a healthier plant. Once planted, cut the vine back to about one foot to encourage branching, and as the first season moves along, keep pinching the tips to encourage further branching. Although this will somewhat reduce blooms that first year, it will prove well worth the sacrifice in years to come with more branches and more blooms. Clematis is a heavy feeder, so adding dried manure to the soil once or twice a year is advisable, as is watering with a liquid fertilizer for flowering plants every month or so. If you are training a Clematis plant to grow up, you may find it necessary to help it along at first by loosely tying it with twine to the structure you want it to climb. Once established, it's will attach itself by winding tendrils around the support and you can remove the twine. Choosing the right Clematis for your area can be a challenge with so many varieties to choose from, but visiting your local gardening store to see what types they offer will help you get a feel for what does well in your area. If buying by mail order or from the internet, most vendors clearly state what zones and climates any given type needs, so read the information carefully. Lastly, Clematis makes a beautiful cut flower that will last for 7-10 days, so don't forget to cut a few to enjoy indoors too!